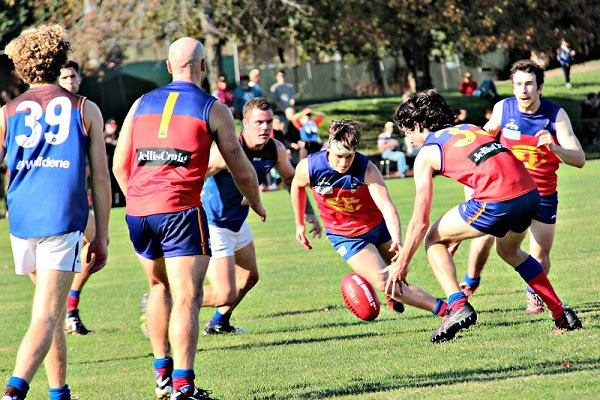 Fitzroy’s senior side may be 2-0 for the first time in Premier B, but the big test comes this weekend when they travel to Brighton Beach Oval to play a team sitting atop the ladder with a percentage of over 400! Old Brighton Grammarians will be a step up in class but so far not much has phased Nick Mitchell’s new team. The senior coach seemed somewhat of a prophet when he told the pre-game lunch on Saturday to look out for a range of new players, including Nino Lazzaro coming up from the Under 19s for his first game. Nino certainly made an impressive debut with 5 goals, spearheading Fitzroy’s win over Peninsula in a somewhat fiery encounter. Nick said the challenge for the coaching group was to balance youth and experience as the talent from the Under 19s and the Colts continued to produce high quality players. The transition is being made easier thanks to the guidance of Michael Pickering, who is playing a development role with the club. If the best player awards in Round 2 were anything to go by, the mix of youth and experience was executed well during the game, as backman Max Ellis was named best player, followed by Lazzaro and Aiden Burke (pictured above competing for the ball), with the one percenter award. What would have made the coach even happier was the challenge in deciding on the best players – it was certainly an even team performance with an even spread of goal kickers as Fitzroy ran away to a 44 point win. Needless to say the coach would have been just as impressed with the form of new recruit Mitch Bottomley, who was also playing his first game for Fitzroy Reserves and kicked a cool six goals in his best-on-ground performance. Not bad, coming off an injury. Mitch hails from McLeod and you’d imagine it won’t be long before we see him and his long sleeves in the Seniors. He was ably supported in the reserves by another new recruit, rated second best on the day, Sam Batterton, who apparently hasn’t played a lot of footy but is a great runner and an elite athlete. It was also win number one for new Reserves Coach, Richard Willingham, who was blessed with a number of returning senior players in his line up on Saturday against Peninsula, notably Vice Captain Tom Cheshire, Ross Boland (coming back from injury and a cricket premiership for his first run), Max Davie, Jack Dalton, Luke Edwards, Nick Marshall and Matthew Gaite. Congrats to the Thirds who also start the season 2-0 whilst both Under 19 teams went down on Saturday. There was more Fitzroy coverage than you could poke a stick at in the Footy Almanac during the week and as always it is great to get the different perspectives. Here are the match reports of King George III, Phil Hill and Rod Oaton. It’s only round two but the Fitzroy-ACU Women 1 team has made the most emphatic start to its first season in the VAFA, with a win over SKOB Saints at Vic Park on Friday night. As the VAFA reported, Fitzroy-ACU remains the only undefeated side in Premier division, beating the strong finishing Saints 33-13. Liz Olney continued her strong and accurate presence in front of goal with two goals in the wet conditions. Claudia Bell, Alex Monacella and Hillary Collett were the best players. Fitzroy-ACU Women 1 plays Ajax this Sunday at the Gary Smorgan Oval and will go in as favourite, with Ajax yet to win a game. The ground has not been a good hunting ground for the Roys, so let’s hope that hoodoo can be broken. After a very tough outing against a strong and experienced Melbourne University side last weekend, the Fitzroy-ACU Women 2 team will be at home this week at Ramsden Street, taking on neighbours West Brunswick. Despite the big margin, there were some strong performances from Emily Goegan, Mish Booth, Sophie James, Alice Batterton, Amelia Crook and Rebecca Petrie. This weekend is the final of the grading rounds for the VAFA Women’s competition and then the new draw will be developed. For Women 1 they will stay in the Wilson Premier Division, along with the other teams they have played so far – SKOB Saints, AJAX and Brunswick Renegades – but their new competition will be revealed when the VAFA advises of the new Premier teams on Monday to clubs. On Monday, the VAFA will be re-working Grading Groups 1 to 6, which includes Fitzroy-ACU Women 2, into four groups of eight teams. Fixtures for all five VAFA Women's competition for rounds 4 to 14 will be released on the VAFA website on Thursday. One of the Inaugural Roy Girls, Bianca Maes, certainly had an Anzac Day to remember. Currently living in Germany (having played round 1 for Fitzroy-ACU), Bianca was selected to represent the Australia Spirit team against France in the 9th annual Anzac Cup in Villers-Bretonneux. For the record, the Australians won. 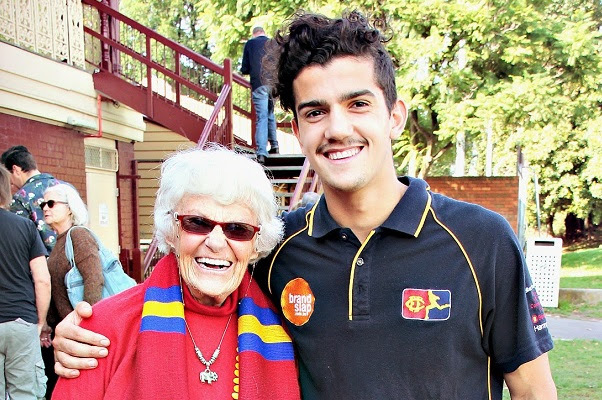 Anyone who’s been to a Fitzroy game at Brunswick Street Oval (or any away game for that matter) will be familiar with the huge smile, the red coat, the white hair and the big voice of Life Member Val Alpress. 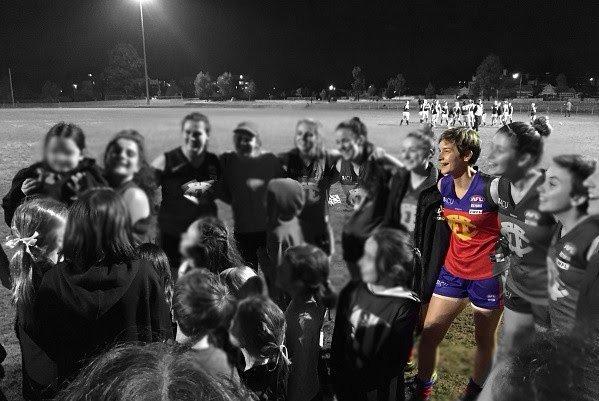 Not only does Val rarely miss a Fitzroy game, but she increases her interest in the results of one young player each year when she sponsors a young Fitzroy player. This year number 18, Will Zaghis, is the lucky beneficiary of Val’s largesse and no doubt some of her advice on on-field matters. Most recently Val has sponsored Dylan Patcas and before that, Harry Topp. “I first got in touch with the club and said I wanted to support a young up and comer who needs a bit of help; someone who’s coming up from the juniors. And I’ve continued to sponsor a young one. “I try to watch them as much as I can and it probably means I watch them with greater intensity to see how they’re getting along,” Val said. Val is a Melbourne fan in the AFL but as a local girl, said she’s always had a soft spot for Fitzroy. “I was born over at the Haven and I lived for a long while in Falconer Street when I was young (just a short walk from BSO), so I’ve always been local. “My husband was a VFL umpire and his best man at our wedding was a player with Fitzroy,” Val said. Not only does Val have a local Fitzroy connection, but she’s pretty much Reds royalty. She was the General Secretary of the Melbourne University Football Club for eight years at a time when women’s involvement in footy was far rarer than it is today. We have other Fitzroy stalwarts who group together in a syndicate to sponsor a player too. If you are interested in finding out more about sponsoring a player – you could do it as an individual like Val, in the name of your business, or join with your mates – please contact Fitzroy Director and Treasurer, Michael Smale. When Fitzroy plays Ajax at home on 13 May, there will be a man with a foot in each camp who will be speaking about his experiences with both clubs at the pre-game lunch. Bernie Sheehy, who coached the Fitzroy Reserves in the mid 80s is a great speaker and motivator. His most recent coaching gig was with Ajax from 2009-2012. In between, his stellar coaching career in the VAFA included 3 premierships in 5 years with De La Salle Old Boys. He also worked as Essendon Reserves Coach under Kevin Sheedy and coached Springvale in the VFA. These days Bernie is a Barrister and Solicitor, having been admitted to the Victorian Bar in 2004. He had an earlier career with the Tax Office. Fitzroy and Ajax supporters are invited to the lunch at Brunswick Street Oval before the teams meet in Round 5 for the Jellis Craig Game. Come along and hear from one of the great characters of VAFA coaching. 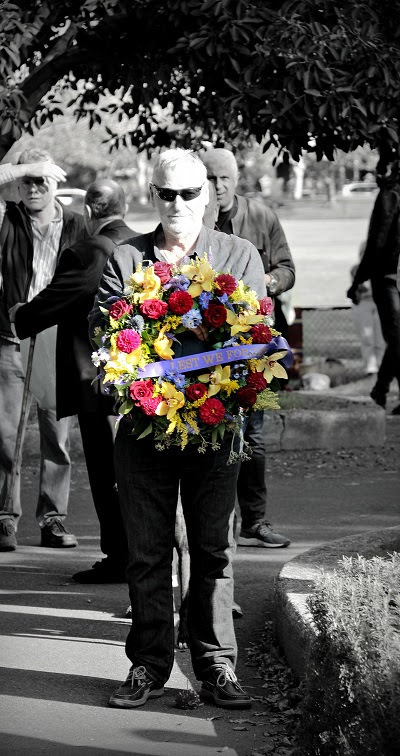 A beautiful ceremony to commemorate those former Fitzroy players and officials who gave their lives fighting for their country was held at the Edinburgh Gardens War Memorial at half time during Saturday’s game. The memorial was built when the local sports clubs raised funds over 100 years ago to commemorate the young men from the local area. Harold Collins 1917, six games 1912 and 1915. Jack Cooper 1917, 136 games 1907 to 1915. George Eliott 1917, one game 1905, University 79 games 1908 to 1913. Arthur Harrison 1917, 19 games 1913 to 1914. Arthur Jones 1915, killed in action at Gallipoli, seven games 1914. Sydney O'Neill 1915, killed in action at Gallipoli, one game 1909. Thornton Clarke 1916, killed in action at Fromelles, four games 1911. Tom McCluseky 1917, five games 1911. Tom Corrigan 1943, 107 games 1922 to 1928. Fred Heintz 1942, 14 games 1931 to 1933. Arty Gay 1943, committeeman, Changi. Desmond Charles Keays 1943, reserves player, Changi. Thank you very much to Bill Atherton who organised the beautiful wreath, which featured the names of the fallen. Sadly he never did see those grandstands again - he died at war in France in 1917. What a wonderful crowd we had down at Brunswick Street Oval on Saturday to cheer the boys on to their best season start in Premier B. Thank you to everyone who came along and created a great atmosphere for The Royal Derby Hotel day. The boys from the Derby have been working on creating their own little Fitzroy football team (or at least some very keen supporters). 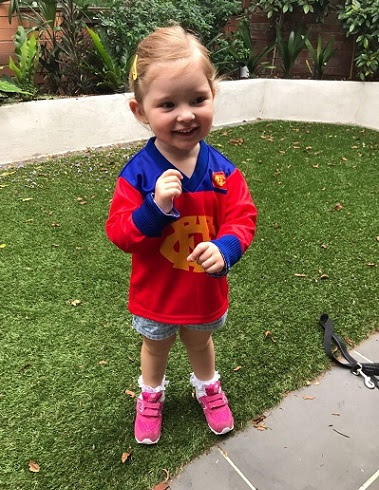 The Club presented Royal Derby Director Kane Tancredi with a new Roy jumper for his fourth baby, while fellow Director Jimmy (James Duncan) showed us little Penny in her Roys’ gear. There was something for the young and the old at Brunswick Street Oval on Saturday and judging by the number of sausages consumed at AusKick, it’s the only place to be. Also present on Saturday was one very passionate and long time Fitzroy fan, Graham Keil aged 90 from Bairnsdale, who attending his first Fitzroy game in 1933 when he was 6. 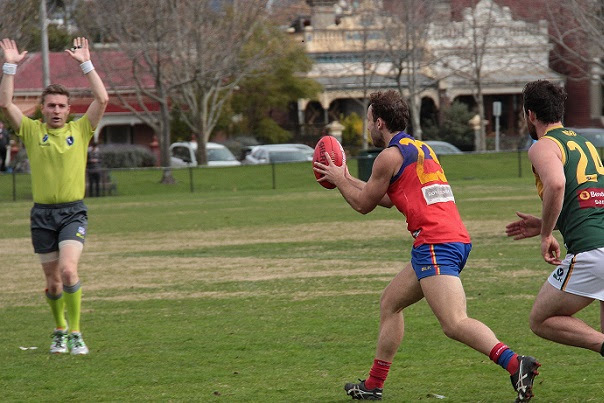 How good do the new Fitzroy jumpers look? A big thank you to our Major Sponsors, Jellis Craig - Inner North and The Royal Derby Hotel, whose logos you will see on the jumpers for the next three seasons, alongside long-time partners, The Reds Foundation. It's great to have sponsors and partners who are right behind the Fitzroy community and community football. Gaitor was also feeling pretty good that for the first time he could tuck in his number 120 jumper! 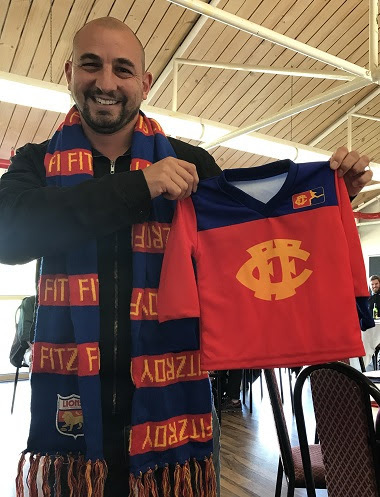 Sports Media students from Holmesglen have been working with Fitzroy Football Club as part of their course and next week we will be running a survey on their behalf to feed into a proposed marketing plan for the club. Whose feet are they anyway? 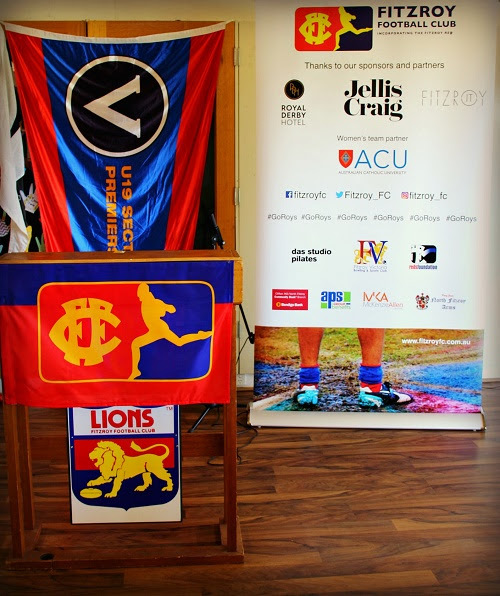 For those of you who managed to get to the lunch or the after match function in the Community rooms at Brunswick Street Oval on Saturday, you may have noticed our new sponsors banner (pictured). The million dollar question is whose feet are they literally glowing at the bottom of the banner? It’s one of Phyllis’s great pics and if you know the owner of the feet (and the boots), let Kate Nolan know and you could be up for a prize. Sadly it won’t be a million dollars. Fitzroy-ACU Women 2 vs West Brunswick – Women’s Grading Group 1 – Ramsden Street Oval, 2.00pm, Saturday 29 April. AJAX vs Fitzroy-ACU Women 1 – VAFA Wilson Women Premier – Gary Smorgon Oval, 2.00pm, Sunday 30 April.